So I tell you the story of my hijab. 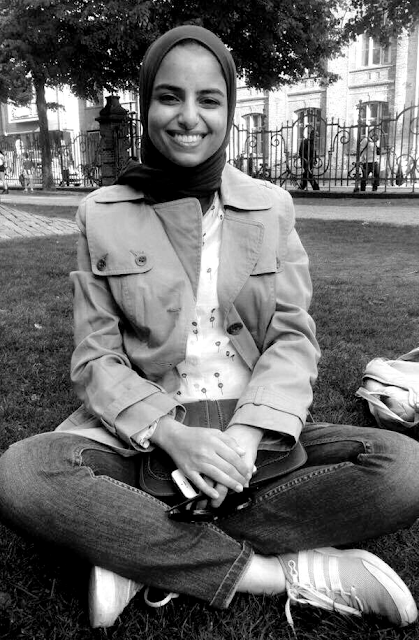 I wasn't wearing hijab until I started to go to college. I didnt't want to wear it just to wear it. But then I did some research and I read a lot about the topic. And after that I was convinced to wear it – and I did. But some members of my family – especially from my father's side – like my uncles and my aunts, were trying to convince me to take it off. They were asking me “are you sure you wanna do that? Did your mom and dad pressure you or anything?” And it's funny that they still every now and than ask me whenever they see me without a scarf in the house. And they keep compliment me how beautiful I am without it and asking when I will take it off. And maybe it's coming – I don't know, I never know. Sometimes I feel like – khallas – just going out without it. On some days I'm not sure, if I want to wear it. But on other days I'm totally sure! But it's not a very big deal for me to be honest. If I want to take it off someday, which is something that might happen in the future – I'm not that kind of person that says “I will never take it off”. Khallas – If I don't believe in it anymore, than I will stop. I'm not gonna wear it for other people. And I think it's stupid that other people congratulate women when they start to wear hijab or take it off. I think now if I would take off my headscarf some persons of my family, especially from my father's side, would be really thrilled. And I think having emotions for both ways is really stupid. Because at the end it is just something you're doing. You're also not celebrating that you're eating.